Next stop on our Tour de France is Alsace. Wow, way to go Alsace in the area of local pride! I stand here (ok sit) slack jawed at the pride that's been cultivated over the years by the natives of this area. Thanks to all the conflicts of war - the peeps of Alsace, rather than aligning themselves French or German are 'repping for their Alsatian roots, and why is this? Well the area has been passed back and forth over the last 1000 years between Germany and France like a shuttle in a game of bloody badmitton. So is it German? or is it French? the end result (and by end I mean right now) well - both are reflected in the winemaking wisdom of the area. To look around the region, you might expect Lancelot to come bounding through a small village with their timber cottages, stone churches and ruins of castles. Thankfully, although historic and beautiful they DO use modern method winemaking, but there is a respect to ancient tradition and like their melding of culture, there is melding of old and new in technique. Here's your nickel tour history lesson from your's truely. Alsace was established as Frank teritory back in the 400 (AD) time period - back then, the Catholic Church (ya, they are still around!) called most of the winemaking shots- and well, hey they were some of the most educated - it was prolly a good thing. Now in the Mid 800's my pal Charlegmane lost part of his kingdom to Louis the German. I doubt it was a friendly game of cards he lost it over.. but needless to say - Alsace got handed over in the meantime to Germany. Now we time travel to the 17th century -- there is another war, it lasts around 30 years (or at least thats what they called it) and at the end France was once the owners of Alsace. (ping pong anyone?) Moving right along, it's the last 1800s and now Germany's back in control. Finally in 1945 - Alsace went back to France, quality returned and the '2nd cousin who lives in a trailer' variety of grapes were forebidden and after some practice and more procedure in 1962 - they were granted AOC status. Since the 80's regs have come into place - Only 4 of the nobel varieties (Riesling, Gerwerts, Pinot Gris and Muscat can be planted in the classified vineyards (aka fancy pants or um Grand Cru I think is the offical name) Got the right grape? now make it yield less than 4 tons to an acre - and by the way, when the wines done, you can't blend it - it's gotta be one varietal only - Now THAT'S pretty strict if you ask me. If you've ever picked up a bottle of wine from Alsace, you might have thought it to be German. Well, it LOOKS like a German wine in that package design (bottle) but does it quack like German wine -- I mean is it sweet? cause you may have seen the bottle and just instantantiously thought it to be sweet - based on judging the bottle by it's shoulders and color (not unlike judging a book by it's cover) -- Don't think yourself bad - most of us think of German wine as sweet (they aren't all, but it's easy to see why we might think that thaks to the majority of German wines exported to the US being sweet) ... what's my line here? oh, yeah, next time you see a bottle from Alsace, take a look and reconsider if you haven't tried it - you might like it... and they are great companions for food - so perhaps invite them to your next party. Most Alsace wines are chapitalized, thanks to low sugar at harvest but of course - French Law forbids Acidification, not that they need any thanks to Mother Nature. Cremant d' Alsace: A sparkler mostly Pinot Blanc sometimes with a little Pinot Noir (really! a red one!) and some Riesling. Vendange Tardive: What we could call a late harvest - the words mean "late picked" This too can only be made from a single Vintage, and has to be one of the following A-OK varieties -- Riesling, Gewurtz, Muscat or Pinot Gris -- also they can't add sugar to these gems, it's gotta be au natural. Selection de Grains Nobel (SGN) These little gems have the wonderful noble rot in them (which if you have ever seen this - it's not pretty to look at infact, it makes you ask -- really? I'm gonna drink something that came from... THAT?) These wines are rich, and sweet, and little sticky and viscious and delish. 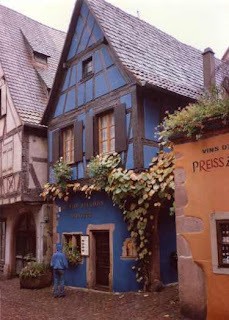 and that my friends is your nickel tour of Alsace -- stay tuned. I'll be back for more. I grew up in Napa Valley, in the wine industry and for many years disliked anything that had to do with it. As an ‘adult’ I came full circle, and embraced the profession of my family for 15 years as a cork dork. I had a Come to Jesus moment in 2011, and long story short and now in law school. In many ways I live a charmed life, and hopefully my writing brings a unique perspective that others can relate to. Recent reviews by Samanta V.